My career in UX began with my own startup in 2002, Annie Jane's Handmade Originals. E-commerce was just starting to get popular on the web. I ran the shop with my family, making handcrafted goods, selling in stores and craft boutiques. Our small business needed more exposure, so I taught myself HTML and PHP and built my first website with tables and placeholder pixels. It was a lot of twisting and tweaking code, trying to make tables work on browsers that didn't follow the same standards. I found Dave Shea's CSS Zen Garden and began exploring standards based CSS/HTML and guidelines from the W3C. The internet was a teenager, exploring it's identity. It was completely moldable into whatever we wanted it to become. My online craft store turned into design requests from other businesses and I found myself working as a freelance UX designer and developer, building out store fronts for small businesses. 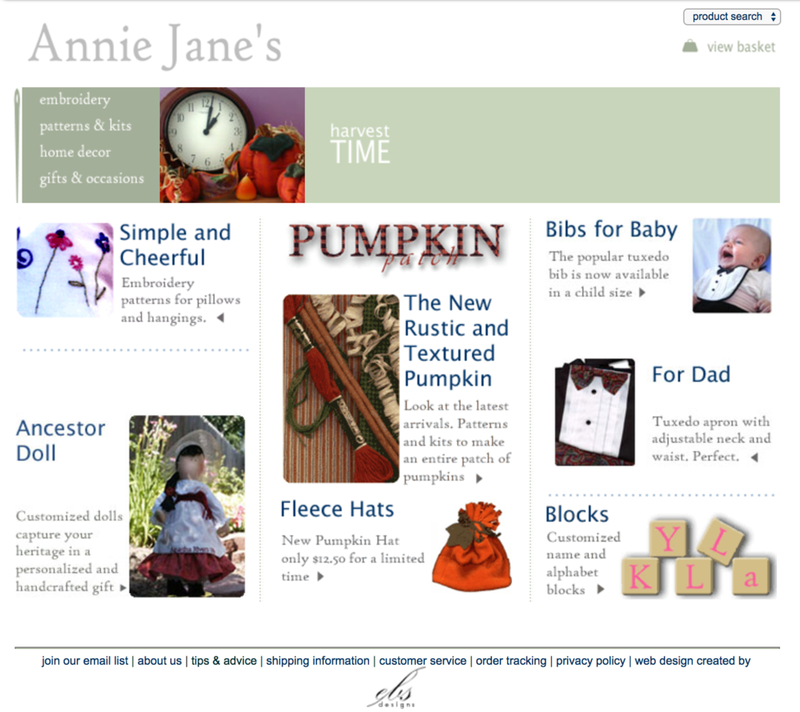 Annie Jane's, my first website in 2003, using tables for layout. I moved to the corporate world in 2007 as an interaction designer, designing enterprise software for online donation management, banks, security monitoring, museum archives. It was a great time to be in UX, even though I needed to validate my existence on every project. The online world was becoming powerful and UX was slowly being welcomed into technical departments, but there was a general mistrust of "creative people." I was at SXSW in 2007, the year Twitter was launched. Thousands of designers were there, and I started to feel that UX was becoming a legit career path. Industry leaders were beginning to make a strong case for user experience and the impact it could have on the brand of a company as well as the bottom line. It's easy to take UX for granted today, but in 2007, it was a struggle to exist and have a seat at the table. I went back to SXSW in 2009 and the amount of attendees had doubled. The new hot topic was content strategy and purposefully structuring content to improve UX. I began work on a large content project, the Joseph Smith Papers, that desperately needed content strategy. I worked across the entire product to improve the experience, from leading a short film, designing the information architecture of the content, the user interface, and the promotional materials. This pushed me into my next position in the organization. After learning and growing as a designer, I moved into a lead role and manager of an in-house team of designers. Having spent five years evangelizing the role of UX, it was time to lead out an effort to bring "good juju", as our CTO called the secret sauce of UX, to a new organization. My job: turn a sixty-year old publishing department into a digital group that could work like an in-house agency, encourage a cohesive content strategy across the entire organization, and build out a flexible workforce. I had been building a network of virtual and personal mentors with design leadership experience. Based on their personal experiences and recommendations, I had a wealth of knowledge that gave me a foundation for the design manager role. Establish equality in groups who had restrictions on equipment use and salary imbalances based on job title, gender, and marital status. There was a bad vibe of discrimination that needed to disappear in order for the employees to trust the new org structure. Create a brand strategy that included voice and tone guidelines so our message felt cohesive across any medium. Create multi-disciplined teams with a strong leader and account managers. Get the right people on board and remove people who had a negative impact on the team. Design creative spaces to encourage team interaction and self management. Create an agency model that conserved budget and resources for peaks and valleys in project requests. Move the team from account driven to creative driven by hiring strong creative directors which would increase the quality of work. It was a big change for many groups and a few resisted working across design disciplines. I made hard decisions to let some go. I did market research into standard job titles and salary ranges, stack ranked all my employees based on performance and skill sets, and then worked with HR to get official titles and pay grade changes. It was important to bring groups in closer proximity to each other, so we started to design new creative workspaces and strategically place design teams. I found existing design teams where animators, graphic designers, UX designers, account managers, and developers were working together to create products and outperforming most of the organization. To retain great designers whose teams weren't embracing the change, I shifted them to high performing teams so they could continue to perform well. Teams that faltered were eventually disbanded and designers let go when they continued to underperform. I hired design leaders who had agency experience and brought them in as creative directors. Print designers had their equipment upgraded and were taught UX skills. Internships with recent college graduates were set up and paired with senior designers, helping both learn new skills. I also built a network of freelance designers and vendors to augment our teams, as well as a bench of full time designers who could rotate onto a team when demand for services exceeded their capacity. Creative directors could request additional help, and I had a list of individuals who were available on demand. We added content strategists to the teams and the wheels of the new organization began turning smoothly. Designing creative spaces, mentoring, and changing culture was tough work, but the rewards were great. When the department became strong and creative directors were recognized as leaders across design disciplines, I was doing more traffic management for an agency and less design strategy. I had worked myself out of job, which meant I had succeeded. It was time to find a new challenge to push myself further. I moved back into enterprise apps as the UX Director for Workfront. Workfront provides work management software for creative teams. I had used the software at my previous job, and the app wasn't very easy to use. It had a lot of potential, but needed some tweaking in the onboarding and document proofing experience. When I arrived, the UX team was struggling and turnover was burning out the rest of the organization. I built a strong UX team of designers and researchers. The company grew quickly. I visited customers around the world on a weekly basis and I set up a remote design team in Armenia. I worked on bridging the gap between marketing, sales, and UX by providing their teams with analysis of the UX research my team was doing on creative teams. This was a great springboard for the marketing team to pivot the company from AtTask to Workfront and helped the product management team stay focused on scope. I traveled with sales and support teams to figure out why onboarding was such a struggle with the product. When it was time for me to move on, my team cried! A lot of sweat and tears went into building the team. In truth, I was struggling to maintain a work life balance with so much travel. My team was in a good place and a few of the senior designers were ready to step into a leadership role. I had a desire to get back into design and work on consumer apps. The timing was just right as I took on a UX designer role at Ghostery. Ghostery was an opportunity to work on a consumer facing product at a startup. The tool hadn't been updated for more than five years, and it needed a refresh as well as an improved experience for a new audience. The Ghostery extension had become popular when it was recommended by Edward Snowden. The user base were a passionate group of users who were technical experts in script blocking and privacy tools. Changes in the product needed to balance current users' use of the tool but also encourage people who had never used ad blocking or script blocking extensions. User testing validated that once newbies understood the product, they quickly became advocates. Our first launch of the new design went horribly wrong. Hate mail and angry reviews came pouring in. We were about to scrap the product redesign. My product manager and I did some deeper digging into surveys and stats and realized that only a small percentage of users were unhappy and the rest (10+million) weren't complaining and our daily installs had increased. We had swung too far towards new users and too far from the dedicated fan base. We categorized the colorful feedback and saw the complaints were about a few core features that I had removed or buried to make the tool feel simpler to use. (Note, when user tests are moderated or paid, people will not tell you the truth.) Version 2.0 fixed the friction points and when we launched the second version, the sentiment quickly changed. People posted screenshots on social media with compliments and recommendations for their friends to download the tool. Tech blogs wrote positive reviews about the update. Hurrah! Ghostery, greatest thing since kissing. My company sold the Ghostery extension and brand in 2017 to focus on their B2B privacy and monitoring tools. I rebranded the company with a fresh look for Evidon, the company's previous brand. I'm bringing the lessons learned from the extension redesign to our enterprise products. It's a great team with some of the best developers I've had the chance to work with. I see great things in our future.